One of my favorite weeks every year is the initial gathering of the Aspen Institute New Voices Fellows in Johannesburg. The New Voices Fellowship is a year-long training and mentoring program aimed at elevating voices of experts from the developing world in the global development discussion. Beyond being experts in their field, they are also incredibly inspiring and interesting people. The kind of people you could spend a week with and then feel like it’s just not enough time. You’ll know what I mean when you read their brief bios. We had a lively discussion about “What is development?” after watching Dapo Oyewole’s TED Talk. Even as a kid, he rejected the idea that he was part of the “third world.” He asks the question, “Who and what defines development?” Watch it. It’s really good. We listened to a seminar run by the Op-ed Project, which is more than a training about op-ed writing. The fellows walk away with a clear understanding of the value of their specific expertise (like beneficial microbes in soil!) and the potential impact of this knowledge to a much larger global conversation (growing food, anyone?). Paula Fray from Fray Media led a session about the shifting media landscape, and what the Fellows need to know when they communicate with print journalists, radio and TV, online, and on Twitter. Do you know how much time you typically have to get your message across if you’re being interviewed on a TV news bulletin or the radio? 15 to 17 seconds, or about 40 words. Anna Umimba showed some great examples of public speaking, including Nobel Peace Prize Laureate Wangari Maathai’s story of the hummingbird. We also watched this brilliant speech by 2013 New Voices Fellow Dr. Ola Orekunrin at the Aspen Ideas Festival’s Spotlight Health series. Rachel Harvey, a former BBC journalist, and I had the fellows practice their pitching skills. Below is Kusum Thapa, who works on maternal and child health in Nepal pitching (on the phone, can you tell?) Fellow Misan Rewane, to speak on the links between education in Nigeria, the upcoming elections, and Boko Haram. We’ll do that interview! 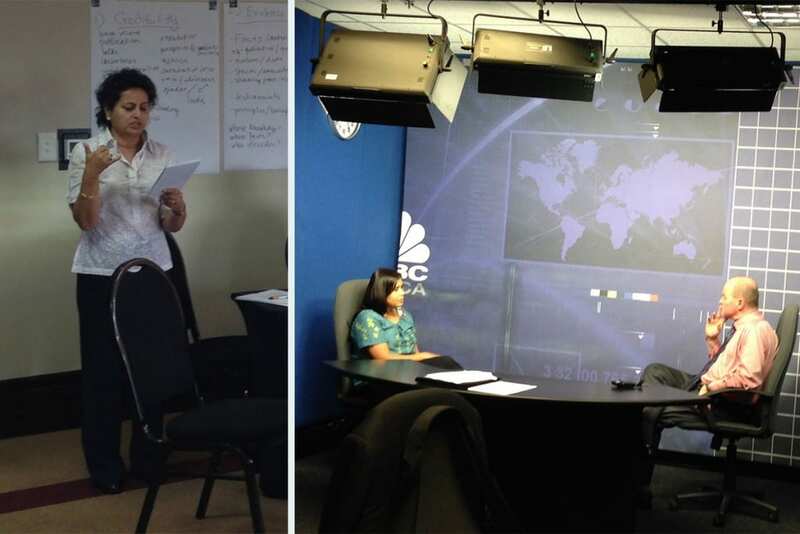 The Fellows practiced on-camera and on-radio interviews with David Williams, a senior anchor with CNBC Africa. Below is New Voices Fellow, Elsa D’Silva, rocking out her final on-camera interview about the importance of reporting and tracking sexual harassment in India. I am so energized by the conversations and the ideas generated last week, and look forward to seeing what they will all be doing this year! You can follow all the New Voices Fellows including those from previous years on Twitter here.